While I was still getting used to the controls in Let It Die, the latest game from Grasshopper Manufacture, I accidentally ate an explosive mushroom instead of tossing it at some nearby enemies. As one can surmise this wasn’t a very good idea. Instead of blowing up my adversaries like I wanted to, it instead left me at death’s door after the bomb exploded inside my body. I’m not very adventurous when it comes to trying out new types of food, but I wouldn’t recommend it. If anyone was worried that the latest game from the Lollipop Chainsaw developer, which has been made in collaboration with GungHo Online Entertainment, wasn’t going to be as weird as past efforts they can rest assured. Let It Die features all of the signature weirdness of a game bearing Suda51’s name. In fact, it’s filled with crazy ideas that manifest themselves in both the gameplay and the story. When it’s not showing off cutscenes that feature a skateboarding grim reaper, Let It Die is a pretty straightforward action game. The goal is generally simple: run through the level, kill whatever enemies are in your way, and make it to the next floor of the Tower of Barbs, a giant building filled with monstrosities that the player is climbing for some reason. The game’s story in the beginning sections takes a backseat to introducing the action, and this left me with more questions than answers after a few hours of play. That’s not a bad thing, though, as it gave me a desire to push forward and keep moving on. As mentioned earlier, it’s pretty easy to have a good run go sour due to the game’s control scheme having a pretty lengthy learning curve. Each trigger controls a weapon (such as a wrench or a hockey stick) and the DualShock 4’s bumpers offered up alternate attacks. While unique, that portion of the controls weren’t the issue. The problem is with how the game uses the controller’s TouchPad, which is used to both eat items (which are mushrooms and frogs that are found around the environment) and throw them. It’s pretty simple in theory as pressing the left side will throw the item, while pressing in the right side will cause the player to eat it, but I found it difficult to remember what to do when the in-game action got intense. The challenge in Let It Die typically comes from facing off against multiple enemies at once, as I found that I could typically unleash combo attacks repeatedly against a singular foe and they’d die with relative ease. That strategy doesn’t really work when there are three headless zombie-creatures running at you, and sometimes in a moment of panic, I would accidentally attempt to throw a healing item instead of eating it. This became less of a problem as I played more of the game, but it did make the early hours of the game feel a bit more convoluted than it should. While the combat can feel a bit rough around the edges, it’s definitely satisfying. It’s good to have different types of weapons assigned to each hand to create combination attacks (I really enjoyed using a hot Iron to stun an enemy and then slash away at them with a blade in my other hand), and there are some absolutely brutal finishing moves. While there are guns, the early stages focus more on melee weapons, so I had to do my dirty work up-close and personal. Enemies can also be locked-on to by clicking in the right stick, and I had the most success when I was managing distance, letting enemies miss their attack and countering back with strikes of my own. One thing I haven’t mentioned yet is that Let It Die is a rogue-like title. That means if the player dies, they can lose everything they have (weapons, money, items, etc.). There’s a way to circumvent this, though, and that’s by purchasing life insurance, which costs a single gold coin of in-game currency. I started off with around 1,000 continues, so I was never shy about using my coins, but this system does encourage the player to find elevators throughout the tower. These can be used to travel back to the in-game hub and store various items (such as weapons and money). 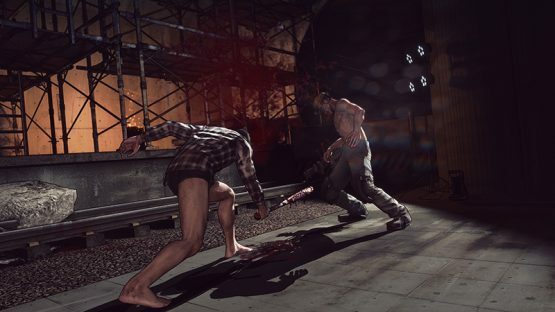 This makes Let It Die feel like more of a marathon than a sprint, as a good player is going to want to slowly level up their character by replaying floors they’ve been on, and get powerful weapons before moving onto new floors. I’m a bit worried that progressing will feel like a grind, but I definitely need to play more of the game to find out. Levels aren’t procedurally generated, but there are random elements (such as enemy layouts) to help them feel a little bit fresh each time they are played. After finishing Let It Die‘s first boss fight, which wasn’t very interesting as the enemy felt like a huge bullet sponge, I unlocked access to the game’s multiplayer mechanic. I found this portion of the game to be very similar to Metal Gear Solid V, where players could infiltrate enemy bases. I simply would take a train to another player’s base, fight off a few enemies, including their avatar, and then was able to take some resources after I was proven the superior combatant. It’s pretty simple, but there are good reasons to participate. The main one is that resources are hard to come by and are needed for blueprints (which are used to craft new weapons), and that the player can kidnap their foes and bring them back to their base. After bringing them back, these characters then hang out in the bathroom, and will help combat any invasions that occur. They also can be leveled up in order to provide better protection. Let It Die looks to be yet another example that dispels the negative stigma attached to free-to-play games. The combat has plenty of depth with weaponry getting more ridiculous as players scale the Tower, and it doesn’t feel out of place when compared to other full-priced action games. It also doesn’t seem to fall into the free-to-play stereotypes that players imagine, and there aren’t microtransactions popping up around every corner. From what I’ve experienced, the main way GungHo looks to monetize is by selling a luxury elevator pass. Lasting 30 days, this pass allows the player to ascend the Tower of Barbs without spending additional money. This gives players a lot more freedom while playing as they don’t have to worry about the financial cost of returning to the game’s hub area and can always go back to either purchase or store items. Since I wasn’t able to spend any money during the preview event, I can definitely say that I didn’t feel left out by not getting to use the elevator and it doesn’t feel overly intrusive. Granted, that’s just for the opening floors so things could possibly change later on where it feels like more of a necessity. What is perhaps most impressive is how the game seems to embody the philosophy of getting players to just “give it one more try.” There’s always some small goal to accomplish from finishing fetch quests to leveling up different bodies to defend your base. I’m definitely excited about giving it a further look once it officially launches later this year, although I am a bit worried about it feeling like a grind. I just hope that other gamers don’t dismiss it simply due to its business model. Disclosure: GungHo hosted the Let It Die preview event and paid for hotel & airfare.